We had a customer that had created an O365 Tenant with the Power BI License. Then they added a custom domain to their Tenant and added new logons for the custom domain. After that, they removed the original logons with the onmicrosoft.com domain. The account that they were trying to access this with was a Global Admin as far as O365 is concerned. The problem here is that the Power BI Admin Center has it’s own Role Management. You have to explicitly declare who can access the Power BI Admin Center as well as the Data Steward items. For example, I created a new tenant. The asaxton account was created as part of the tenant creation. The johndoe account was created after. Both are configured as Global Admins. 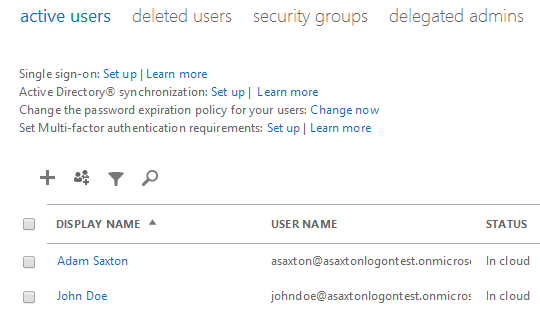 If we go to look at the Role Assignment within the Power BI Admin Center, I only see the asaxton account. As a result, when I try to hit the Power BI Admin Center with the johndoe account, I’ll get the unauthorized error that is listed above. 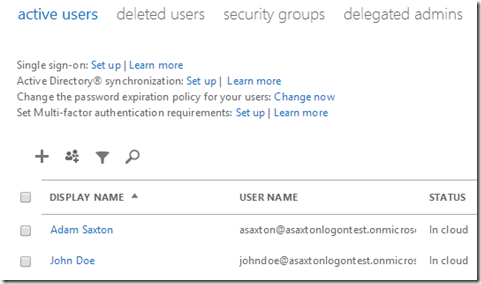 Be careful when adding a custom domain and adding users under that domain. Make sure that you have listed one of those new users in the Admin Group within the Power BI Admin Center, otherwise you may prevent yourself from being able to access the Admin Center. Currently, if you inadvertently block yourself from the Power BI Admin Center, because you deleted the onmicrosoft.com accounts or any account that had access, you will need to open a Support Ticket to get that corrected.